Barcelona v Bayern Munich. Two of the biggest clubs in the world head to head in the Catalan capital in an important early season meeting, broadcast on live television in every continent. The hosts take an early lead and, although Bayern rally after the break, another powerful surge from Barca – with summer signing Jaka Blazic to the fore – allows them to seal the victory, sending their fans home happy. What’s going on here? Have you missed something? Why didn’t you hear anything about this game until now? And who is Jaka Blazic? This is not a work of fiction. It was a real game, played on 18 October. The venue? Palau Blaugrana, the indoor arena next to FC Barcelona’s Nou Camp. The occasion? 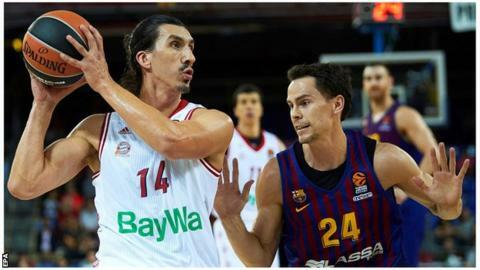 Barca’s first home game of the new season in EuroLeague, the continent’s top basketball competition. You might now be wondering why a basketball game is introducing an article about football, but it is fundamental in understanding why elite clubs have seriously considered breaking away from Uefa to set up a European Super League. The assertion, based on leaked documents, that Europe’s top clubs have been plotting their own Super League, was dismissed by two of the continent’s most influential football officials last week. But the fact remains that, privately, the most powerful European teams want a system that ensures one thing – the best regularly playing the best. And envious glances have been made towards basketball’s EuroLeague, where big games are guaranteed. Take Barcelona v Bayern. In EuroLeague, the clubs know they will meet twice a year. In football, they have not played each other since 2015, and the date of their next fixture is entirely dependent on the luck of the draw. Since their last meeting, Barca and Bayern have been kept apart while playing in the Champions League against teams such as BATE, Rostov and AEK Athens. To be blunt, that is not the kind of company they want to keep. They want to play against each other in the same manner as their basketball teams, even if it means creating a new competition to do so. Many key figures at top European clubs have felt that way for a long time, and their patience will run out – especially when they can already see their clubs doing exactly what they want in another sport. Barca and Bayern’s basketball teams, along with Real Madrid, are among the 16 competing clubs in EuroLeague, which follows a home-and-away league format with 30 games over the course of six months, before the top eight advance into knockout play-offs. The competition is owned and organised by the clubs, who felt they needed to break away from their sport’s governing body nearly 20 years ago in a similar manner to the creation of the Premier League in 1992. And there is one key reason why the EuroLeague structure appeals: money. A guarantee of 30 games, rather than an absolute maximum of 13 in the current Champions League (and possibly as few as six), firstly means the opportunity to earn a lot more from ticket receipts and the lucrative matchday hospitality market. It also provides a major opportunity to significantly boost revenues from the two main financial drivers of modern sport – sponsors and broadcasters, who will lap up the opportunity to showcase their brands and fill their schedules with a weekly supply of premium quality games, featuring the world’s most popular teams and most famous players. EuroLeague basketball, as club executives are well aware, has reported a growth in revenue of 103.3% in media rights and 49.9% in sponsorship since adopting the league format two years ago. Another big attraction for clubs is the opportunity to keep all this extra revenue for themselves rather than losing a large slice to Uefa, which takes about £600m annually from the Champions League to cover administrative costs, solidarity payments and general projects. Money, as always, is talking. And the clubs are hearing the message loud and clear. Will fans love it or hate it? Or both? Clubs, broadcasters and sponsors might love the idea of a Super League, but what about another crucial stakeholder in the game: fans? The reaction of many supporters has been hostile, with a long list of complaints including the anti-sporting principles of a ‘closed’ competition lacking relegation or promotion, an excessive focus on money-making, the risk of damaging domestic leagues and an erosion of time-honoured rituals and traditions. However, the reaction of British fans will not necessarily be shared by other supporters around Europe: an online poll by Spanish newspaper Marca last year saw 58% of the 93,000 respondents say they would be in favour of the creation of a Super League. There is also a key distinction between match-going fans and the ‘new breed’ of supporters – constituting a large majority of the overall fanbase – who live all over the world and follow their teams on television and increasingly through social media. Former AC Milan owner Silvio Berlusconi supposedly quipped that the most important role of fans actually inside the stadium is to make the product look better on television – and the bosses of La Liga seem to share that view, introducing a new regulation two years ago which obliges clubs to sell tickets in the stand directly facing the main television cameras. And it’s worth bearing in mind that just because the traditionalists shout the loudest, that doesn’t mean they represent the majority. Should all Manchester United fans be treated equally whether they live in Arizona or Altrincham? Or should the opinions of match-going supporters be given more weight than those who follow their teams – and perhaps even more so their favourite players – from afar? The answers to those questions might not be as clear-cut as traditionalists assume. The example of EuroLeague basketball suggests even match-going fans could end up appreciating the change in format: average attendances have increased by 17.4% – to an average of 8,864 – since the league structure was introduced two years ago. The idea of a Super League has been floated for so long, without anything happening, it would be easy to dismiss the whole concept as pie in the sky. Creating a new league from scratch, especially in the face of fierce opposition and potential legal challenges, would certainly be a hugely risky venture for the elite clubs, however powerful they might be. And the whole thing, indeed, could just be one big bluff: rather than truly intending to breakaway, the clubs may just be attempting to force Uefa into remodelling the European calendar and system, something that has already been discussed. There’s also a train of thought within English football that continental clubs are chiefly interested in bridging the huge financial gap between themselves and their Premier League counterparts. None of this, however, means the plans should be taken lightly. Many key figures within top clubs are deadly serious in their ambition to create a new tournament which allows them to compete with their peers, and the example they’ve seen on basketball courts has given them an idea of how it could work.